Powers/Abilities: Ashius was able to surround himself with an aura of fire and he could also apparently generate illusions, such as projecting several images of the same person to confuse opponents. Ashius also controlled the giant, flaming Fireball, which he boasted no one had ever made their way through. Despite all of his power, Ashius enjoyed testing his opponents by forcing them to complete various puzzles. History: (Marvel Super Heroes Jumbo Coloring & Activity Book/2) - When Ashius prepared to invade Earth, the extraterrestrial Blue Star telepathically summoned together Earth's heroes in an effort to stop Ashius. The first hero to receive the mental message was Captain America, followed by Hulk, Thor and Iron Man. Ashius generated several illusory duplicates of Blue Star and then forced the heroes to complete several puzzles including his "Erase-a-Letter Puzzle" to confuse them. The determined Hulk was forced to complete a missing letter puzzle while Captain America was tasked with coming up with words using the letters of Blue Star's name. The easily-confused Hulk was next forced to do a word search for Blue Star's name while Thor was placed into a star-shaped maze. 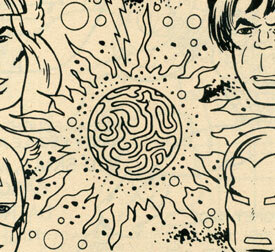 After Ashius forced Iron Man to complete words containing the word "us" by using clues given by Ashius, he forced the heroes to make their way through his giant flaming Fireball. Comments: Created by David Anthony Kraft, Winslow Mortimer, Mike Esposito, Owen McCarron, Ed Hannigan, Chic Stone, Michael Chen and Ron Zalme. Despite this story being seen in a coloring book, there is absolutely nothing to say that it would not fit into Earth-616 continuity. Ashius' Fireball appeared to be planet-sized but it was never in comparison to other objects so it remains unconfirmed if that is the case. It seemed to me as if Fireball might have been Ashius' planet-sized base of operations, similar to Galactus' ship. Strangely enough, the story featuring Ashius and Blue Star ended with the heroes being forced to make their way through Ashius' Fireball. It was never revealed whether they succeeded in stopping Ashius but one can only assume they defeated Ashius and saved Earth since the planet was not later seen ruled by Ashius. Since the story was in black & white and Ashius was never seen next to any of the heroes, it was impossible to determine his eye/hair color or height/weight. 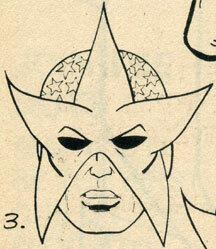 Blue Star was an extraterrestrial who sought to stop Ashius' invasion of Earth. In order to warn Earth, Blue Star telepathically summoned Earth heroes Captain America, Hulk, Iron Man and Thor. 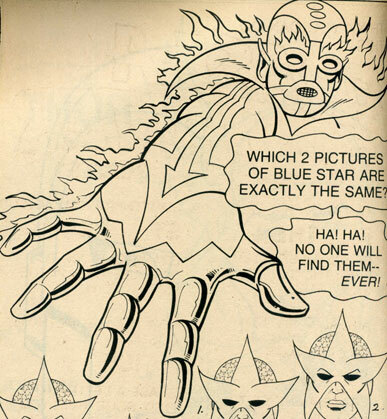 When the heroes confronted Ashius, Ashius generated several illusory duplicates of Blue Star. Fireball was a fiery, maze-like item possessed by Ashius. It was unclear if Fireball was his base of operations but Blue Star telepathically contacted Earth's heroes from Fireball to get their help against Ashius. After Ashius tasked Earth's heroes with various puzzles, he forced them to make their way safely through Fireball and boasted how no one had ever made it through.